results, shading them from light to dark based on intensity. This is a shapefile with a handful of zip codes in Virginia. """Creates Symbology for each value in range of values. Values are # of patients per zip code. in a graduated fashion from light pink to black depending on intensity"""
in QGIS. This is simple enough to do. In the first three lines I created a uri which is the path to where my file is stored. specify this range of values and create a custom symbol for each. list. This will hold the symbol for each range of values. for this geometry type. I manually specified this color using a hex string (“f5c9c9”). This hex string is a pinkish color. 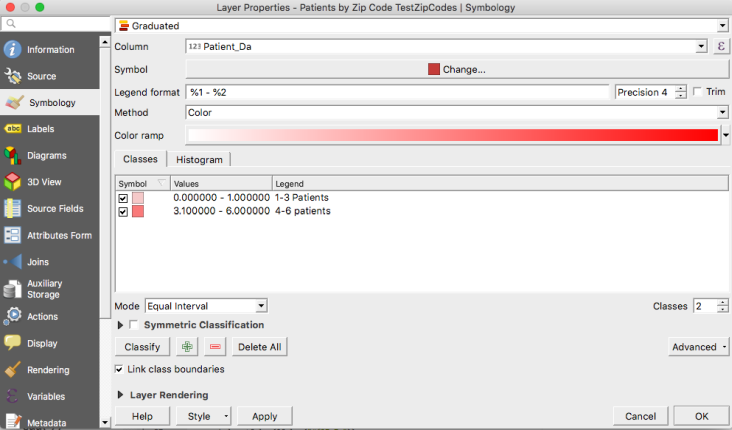 Lastly, you must render your layer and apply the graduated symbology. so hopefully this serves as that for you.